I have a fun and different post for you today. Normally I like to post something about food, like a recipe or my traditional Yum Yum Wednesday product reviews. Well today I am covering both of those ideas. I have a fun product for the whole family to love and it grows food. Score! So what is this fun product I have? 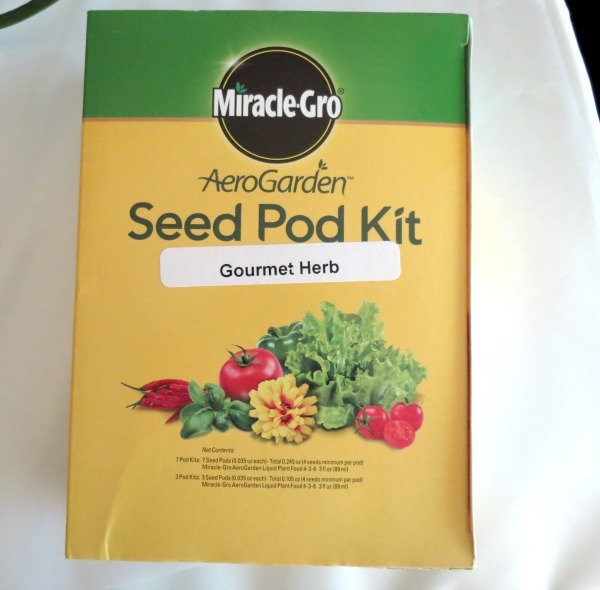 It’s the Miracle-Gro®AeroGarden®. I have to admit, the perfect little holiday gift for the green thumb or the not so green thumb friend or family member in your life. This is so cool! I got my AeroGarden 3SL the other day and I couldn’t wait to set it up. I took it to work, so I could grow basil, parsley and dill in the office. That way I can add my office grown herbs to my salads and sandwiches. But the best part is that I can grow herbs and other produce in the winter. 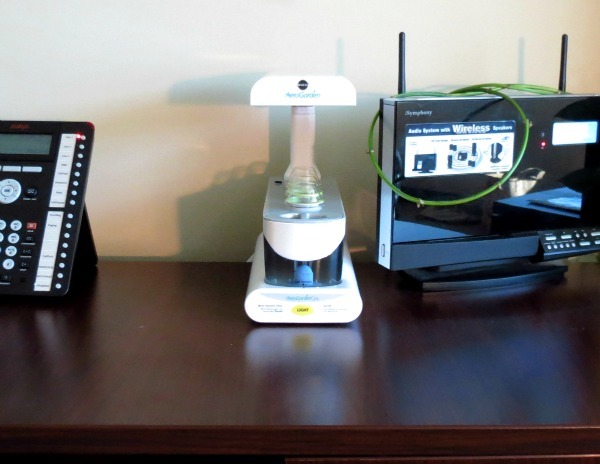 The AeroGarden 3SL is super easy to put together, it took about 5 minutes. Just snap in the light, put it in its place and add water. Easy peasy! 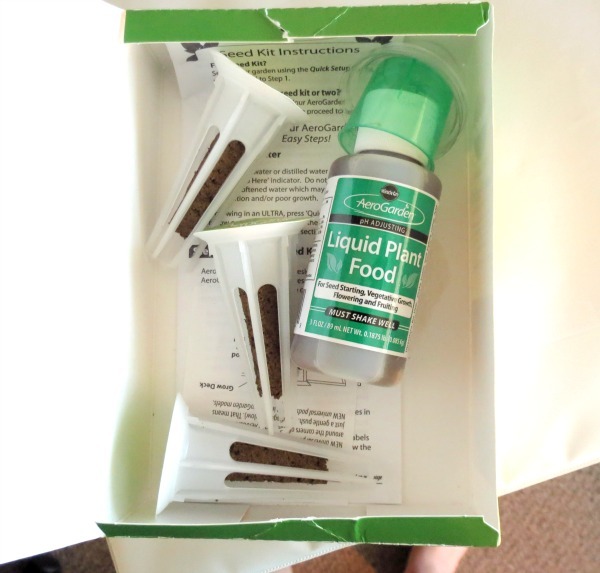 The fun part is the Gourmet Herb pack that came with it. It came with 3 pods, 3 cups to cover the pod and plant food. I just place my pods in the AeroGarden 3SL and put my food in the water and I am all set to grow. Here is a little information about the AeroGarden. The AeroGarden 3 uses NASA-tested indoor growing technology to grow 5 times faster than soil yet it’s so simple to operate that no green thumb is required. Plants grow so fast because roots are delivered an ideal balance of water, air and specially formulated Liquid Nutrients – with no soil needed. Just add water and grow! The AeroGarden 3’s easy-to-use Control Panel turns lights on and off automatically and tells you when it’s time to add nutrients. Nothing could be simpler. I have a spare desk in my office, so I placed my AeroGarden 3SL there. I love it and it’s thin enough that it doesn’t take up a lot of room. I bet you can guess my giveaway. 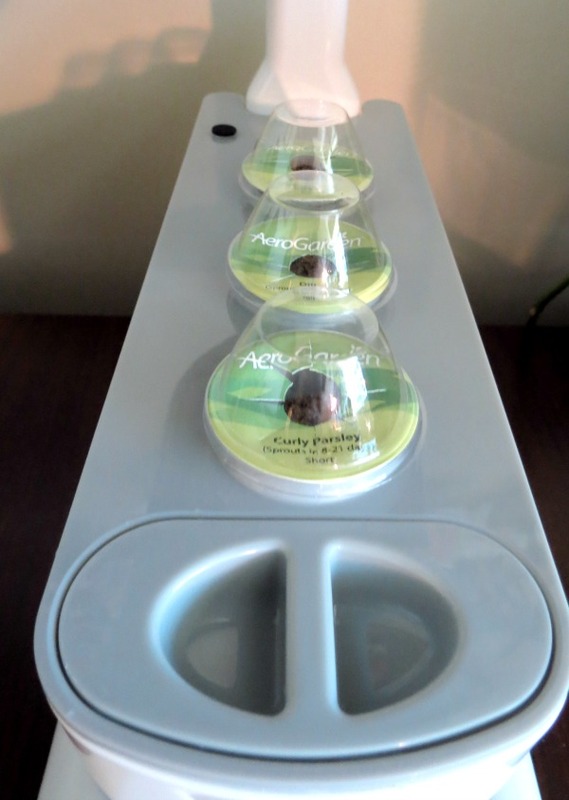 I am giving away an AeroGarden 3 to one of my lucky readers. 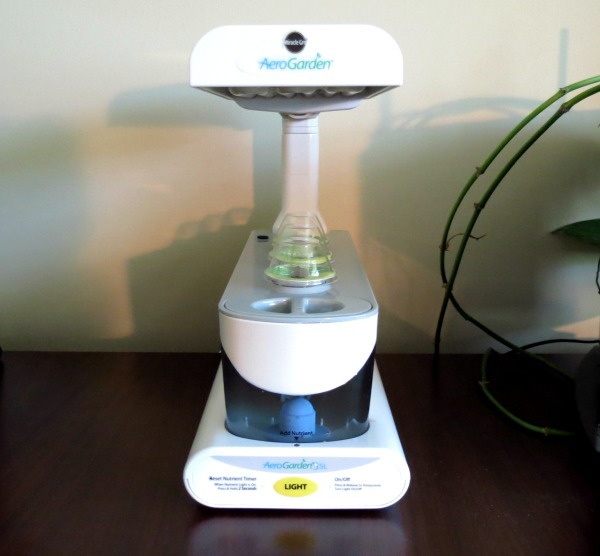 Now the AeroGarden 3 is a little different from my model that I am showing you in the pictures above. It’s the same concept and comes with the same herbs, parsley, dill and basil, but it is a different shape and comes in the color black. Here is a picture of what you can win. To enter, all you have to do is telling me what vegetable or herb you wish you could grow year round? 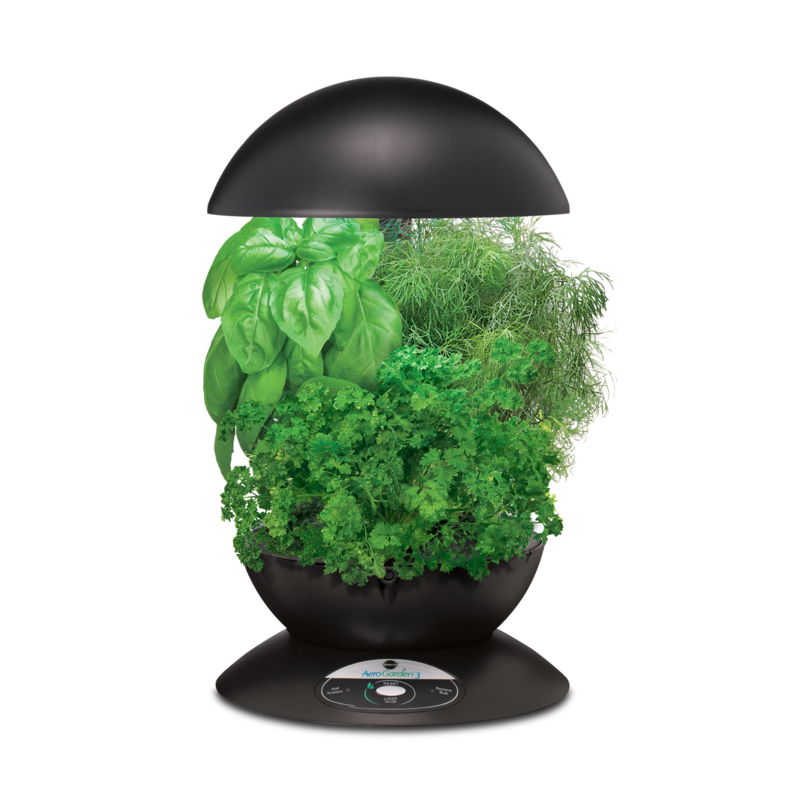 You can check out more information on the AeroGarden 3 here. 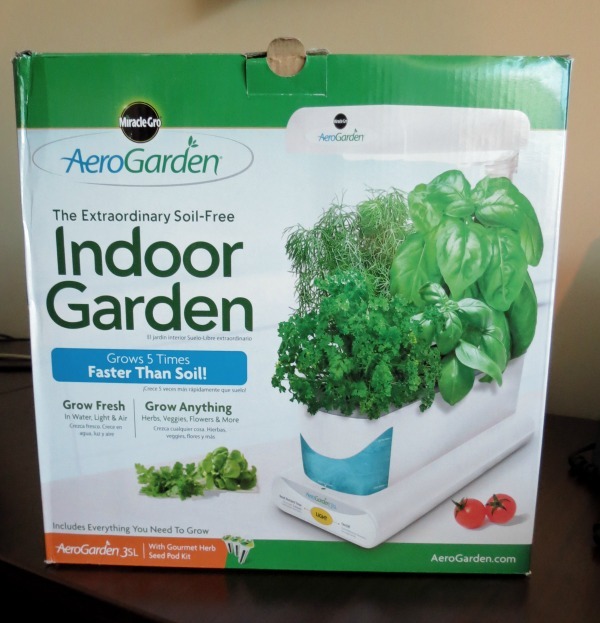 You can also find the AeroGarden at Amazon.com, Walmart.com, HomeDepot.com, select True Value stores. Watch on my Instagram page to see the progress of my AeroGarden. P.S. I was not paid for this post, I was asked to review the AeroGarden all opinions are my own. I would love to grow basil year around. Light pesto is delicious. I’d grow rosemary or sag . Maybe some thyme? Oregano? Do I have to pick one? Tomatoes!!! There is nothing like fresh garden tomatoes. I love to slice them and eat them with a little salt and pepper or throw them in a salad. I discovered basil and all the wonderful things to make with it, so that is what I would love year-round! I would really like to be able to grow basil and oregano. I wish I could grow oregano year ’round! Loving Rosemary for the Holidays! This would be great for my daughters classroom! I would love to grow tomatoes year round. Nothing better than a just picked tomato. I have almost tried one of these a few times! We love corn and would love to have it fresh year round. Very sad when corn season comes to an end. I would LOVE to grow basil and tomatoes all year round for fresh , home grown caprese salad !!! I would love to grow tomatoes and basil!!!! Grape tomatoes, basil and cilantro. Use these so much and I hate to buy them in the witner months. I would love to grow cherry tomatoes all year round. I love to take them to work to have with a sandwich at lunch time, or in a salad for dinner, or as a snack any time. Basil and chives are the things I’d love to grow all year! I would love to be able to grow lettuce year round. I would love to grow basil and cilantro year round. tomatoes and everything else to make a good salsa! I would like to be able to grow basil and cilantro all year ’round, since I use both of them all the time. Just wanted to say I have an AeroGarden and love it. Upkeep is so minimal, and the results are fantastic. We especially love having lots of basil on hand! I am another that has to say tomato. Is this big enough to accomadate a tomato plant though? I guess I am just skeptical. I would grow basil year round! There’s nothing better than fresh basil and buying it in grocery stores or freezing fresh grown for the next 6-8 months just does not do it justice! I would love to have lettuce all year. I eat a salad every day and would love to have fresh lettuce available!! It would be basil for sure! I want to grow orgeano year round because it’s delicious on everything. I mean everything. The crisp clean taste with a bite yum! I live in San Diego so I have tomatoes all year round. I would like to grow fresh spices in my kitchen though. I would love to be able to grow cucumbers all year so that I can make lots of Kosher Garlic Pickles for me and my 19th month old! My two favorites – Basil and Cilantro! I would love to be able grow and harvest basil year round. I wish I could grow basil year round to make pesto whenever I wanted. What a wonderful giveaway! I would love to grow cucumbers and basil year round!! I wish I could grow tomatoes all year round. Wish I could grow tomatoes year round. I wish I could grow basil and cilantro all year long. I wish I could grow basil, also lettuce. Always wish I had more basil! Rosemary.. I adore it! This looks sooo cool. I’d love to put it in my office! Basil is the one for me! Basil and cilantro!! I used to think cilantro tasted like soap but I just needed to learn how to pair it! It adds so much flavor to spicy/Mexican dishes!! I would grow parsley all year long! I would love to grow Thai Basil all year. I wish I could grow tomatoes all year long – ones that taste as good as those grown in summer; beautiful and sweet! Mmm. Basil! It is so much better fresh and has so many uses. I use a lot of cilantro, basil and Italian parsley, so I’d have to say those three. Tomatoes, also, if there’s room. I would love to grow basil all year long! Tomatoes and jalapeños! So I can make fresh salsa all year. Basil and Oregano for sure! I just started cooking with emeals and am finding I need fresh herbs for many of the recipes. It is $2-3 dollars to buy a pack of fresh basil and it barely lasts a week! I need to grow it myself! I wish that I could grow tomatoes and garlic year around! My husband and I love to cook together in the kitchen and having tomatoes and garlic within hand reach would be wonderful.